The Social Justice Book Club read The Autobiography of Malcolm X in February; did you join in? I, for one, was not able to read along--I had an unexpected delay getting my hands on the book, and a death in the family railroaded my reading (and general life) plans for February. And so my "wrap up" of the month here is sorely lacking, but if you read along, I still want to hear what you thought! Janani is having some computer difficulties, but will have a proper wrap-up post for the February book up within the next few days. 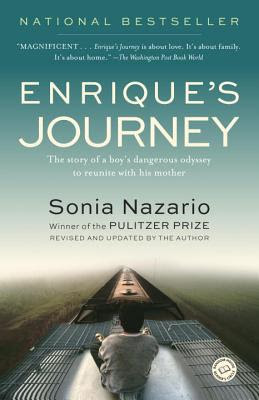 In the meantime, though, it's time to dive into our March book: Enrique's Journey, by Sonia Nazario. If you're already in the Slack group and would like to join this month's discussions, simply add yourself to the #enriquesjourney channel there. If you'd like an invitation to join the Slack, simply sign up here and we'll get you added ASAP. Submit Questions for Author Q&A: Sonia Nazario has graciously agreed to answer a few questions from the group for a club Q&A! Questions will be due to hosts by 3/11 so we have time to share with her and receive her responses prior to the end of the month. And due to popular demand, we're going to try this book club on a monthly (instead of bi-monthly) basis. So mark your calendars: April's book selection will be Headscarves and Hymen: Why the Middle East Needs a Sexual Revolution.